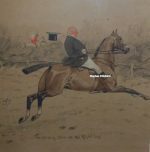 The John King Hunting, Racing and Military prints and original pictures for sale below represent a small selection of the many works available by John Gregory King. If there is anything in particular that you are looking for then please do not hesitate in contacting us on 07889 800857. John King Hunting, Racing and Military Artist was born at West Tytherley near Salisbury and educated at Cranford and Salisbury School of Art. King is strongly influenced by the sporting works of Lionel Edwards. 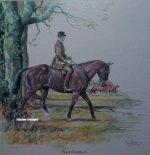 He was a founder member of the Society of Equestrian Artists, and he painted hunting, racing and polo commissions in South Africa, USA, Belgium and France.